In Caribbean Stud Poker, it’s not skill that makes the difference. The game is based primarily on chance. Yet there is a ranking system, and there are certain systems that you can use to turn the odds in your favor. Take in the systems and strategies on this page and increase your chances of winning! Call or fold with certain cards With certain cards you should stand or fold. Betting on the progressive jackpot Know when you should bet on the jackpot. Don’t bluff You can’t bluff in Caribbean Stud Poker. The ace-king strategy This strategy gives you more chance of winning. Always call when you’re holding a pair or higher. Even with a low pair, you’re best off raising. You’ll receive both the bet and the ante back if the dealer has a king or an ace. Always fold if the dealer’s hand contains an ace and a king, and your cards are lower. Whenever you don’t have a pair, your cards must match one of the dealer’s cards. If so, you can wager more. The idea is that the chances of the dealer having a pair are very small. If you wish to lose as little as possible, then it’s best not to bet on the jackpot unless it has at least six digits. The chance of winning the jackpot is namely very small. There is no point in bluffing in this game. This is a poker strategy with the aim of getting an opponent to fold. However, the dealer never passes in Caribbean Stud Poker, so bluffing only generates negative expectations. If the dealer has an ace or a king, then you are recommended to only bet if you have a hand consisting of an ace, a king or a queen, or an ace, a king and a jack. This means you have cards that effectively block the dealer’s cards, and therefore the better ace-king hand. Or in other words, the dealer is unlikely to have a pair. If the dealer’s card is a two through to a queen, only bet if you have an ace or a king, or if you hold the same card as the dealer in your hand. 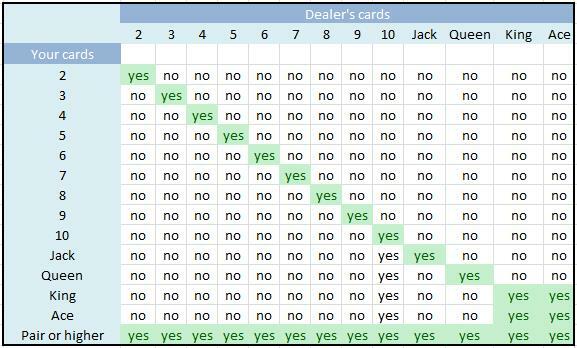 If the dealer’s card has a value of two through five, bet if you have an ace, king or queen. This also applies if you have an ace, king or jack, as there’s a high chance you have the better ace-king hand. If, after reading these strategies, you wish to employ them in the game straight away, you can play Caribbean Stud Poker for free or for real money. Before you start, read our detailed explanation of the rules of the game through again, then you’re ready to go!